Jet grouting is a ground improvement or soil stabilization method. Methods, procedures, applications and advantages of jet grouting is discussed in this article. A study on the history of jet grouting and the present demand of jet grouting method as a ground improvement technique makes us clear about the huge development it has undergone throughout the period. The present status of this method is that it can provide convenient solutions for most of the geotechnical problems. This popularity and high demand are due to the continuous improvement technically, which is continuing. Jet grouting is a method of soil stabilization which involves the injection of a stabilizing fluid into the subsoil (or the soil under treatment) under high pressure under high velocity. The injection process involves a certain amount of site preparation as well as injection equipment. The soil stabilization by jet grouting is occurs due to the hardening of grouted fluid within the soil. These hardened bodies forms like cemented columns which are grouted in numerous numbers as per requirement, thus stabilizing the soil. These columns are called as jet columns or jet grouted columns. Initially, the area where the soil has to be treated is chosen and a hole is drilled to the required depth. The depth depends upon how deep the weak subsoil exist. The hole drilled may be small of approximately 10 to 20 cm. 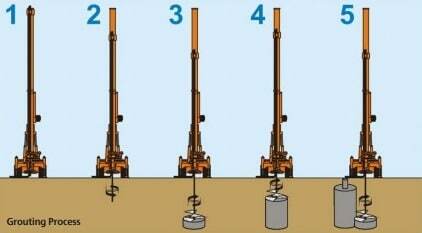 Drilling can be done by rotating drilling system under high pressure to the desired depth. The next step is to place the equipment over the drill hole to conduct the injection process. The equipment consists of a jet grouting string of almost 7 to 10 cm diameter. At the end of this string, it possesses a nozzle in order have an injection at a higher velocity. The nozzle is small of diameter ranging from 1mm to 10mm. Now at the start, the string is raised and rotated slowly to seal the whole column surface with soil and the fluid system that has to be injected. Now the main jetting starts. As it progresses the fluid is injected (through a rotary motion) and the string is raised. Now between the process, a part of mud within the pit created and the fluid mix rises to the top, which is called as spoil. This gives an indication that the bottom is fully sealed with the grout and soil mix. The raising of the string is done in between the process at a distance of 40 to 100mm depending upon the depth of treatment. For each raising, a rotation is performed. There are certain systems in which raising is a continuous process along with the rotation of the string. The speed of rotation of the equipment is kept constant irrespective of the method chosen, which will help in giving us a properly refined grouting column. Based on the number of fluids employed the jet grouting strings are made up of different pipe types as shown in fig.3. In the case of a single fluid system, the W-C grout is injected into the ground through one or more nozzles. Here the soil remolding and subsequent cementation are done by the same fluid. The functions of removing the excess spoil and the binding action are all conducted by a single fluid. This system has a limitation of losing a high amount of kinetic energy. This is because of high friction existing that a single fluid finds it difficult to manage alone. 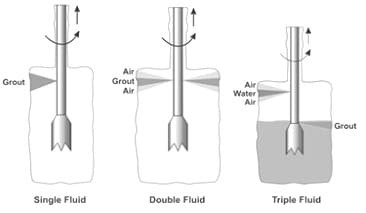 In double fluid system of jet grouting, the soil disaggregation and cementation are carried out by a single fluid i.e. the water-cement grout, but the difference is that the jet of grout is sent to an area of air that enhances the effectiveness of reducing the energy loss. For this, a more suitable air jet is provided through a coaxial annual nozzle place around the grouting nozzle. Here the excess soil is removed by the action of the airlift. Here the soil remolding and cementation are clearly separated. The soil loosening is done by a high-velocity water jet and air. The water jet provided with the help of coaxial air jet, supplied by an annular nozzle similar to the one used for the double system. The water-cement grout is then taken from a separate nozzle that is placed on the lower part of the monitor or nozzle. The purpose of grout is in cementing the soil previously remolded by the water jet . Due to this reason the grout is delivered at a lower velocity. 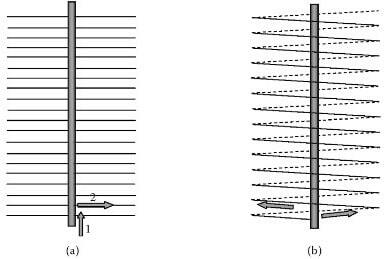 Jet columns can act as horizontal barriers to control the ground water around dams or areas of contaminated ground. This also decreases the soil permeability. Jet grouting can be employed as a method to stabilize foundation systems mainly shallow ones. The procedure involves drilling through the nearby foundation and making a stable bed underneath the footing for better load distribution. 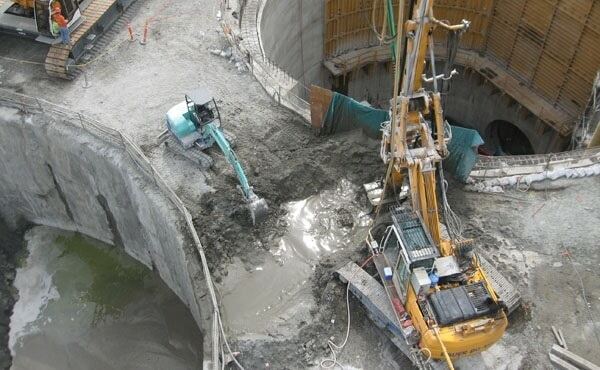 Jet grouting stabilizes the local area under tunnel construction so that heavy equipment required for tunneling can be used without destabilizing the nearby areas. 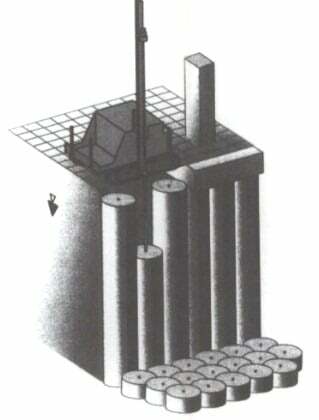 Columns form continuous elements forming in different shapes thus improving the mechanical properties and decreasing porosity. Neenu is a Civil and Structural Engineer and has experience in Design of Concrete and Steel Structures. She is an Author, Editor and Partner at theconstructor.org.